We’ve always been big fans of the Honda Odyssey, but with some great upgrades for the 2018 model year, the new Odyssey is going to be a viable option for car shoppers looking for a true family vehicle. With plenty of new connectivity features and a variety of advanced safety features, Dayton area car shoppers are going to want to check out the 2018 Honda Odyssey. Interested in learning about the features and specifications offered by the 2018 Honda Odyssey? Keep reading for a detailed look at what you can expect from the 2018 Odyssey. Afterwards, feel free to contact a member of our team at Matt Castrucci Honda for more information about the new van, or stop right in and see us at our location in Dayton! Connectivity features are abundant on the 2018 Odyssey. The van offers an 8-inch high-resolution touchscreen interface, CabinTalk, CabinControl, CabinTalk, Apple CarPlay™ and Android Auto™ capability, a connected rear entertainment system, and in-van 4G LTE Wi-Fi. The 2017 Honda Odyssey has a variety of options and packages car shoppers will be able to add onto the vehicle, including heated and ventilated front seats, automatic high-beam headlights, front and rear parking sensors, and rain-sensing windshield wipers. Have additional questions about the 2018 Honda Odyssey? 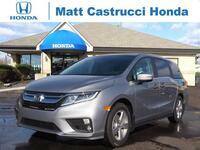 If so, feel free to contact a member of our team at Matt Castrucci Honda. We’ll fill you in on all of the important features and specifications of the van, and we’ll be able to answer any questions you may have about the new van!